If using a Windows desktop OS, you may need to turn on Network Discovery and File and Printer Sharing. Set View by (at the upper right hand corner of the Control Panel) to Large Icons or Small Icons. On the left, select Change advanced sharing settings. Right click on the folder that we want to share and select Properties. Note: If the Share button is greyed out, the folder is already being shared. Click on the Advanced sharing button. Select the Permissions button. Select the permissions you want to allow, such as Full Control, Change, or Read. By default, folders inherit the permissions on their parent folder. 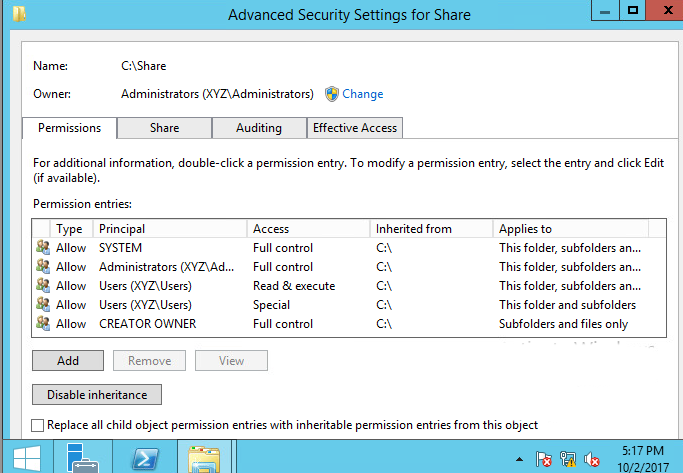 In this example, the folder named "Share" inherits the parent C:\. Inheritance can be disabled by selecting Disable inheritance > Convert inherited permissions into explicit permissions on this object. Once inheritance is disabled, the "Inherited from" column will display "None".